A training guide that explains how to develop a hazard assessment and what type of control can be used. 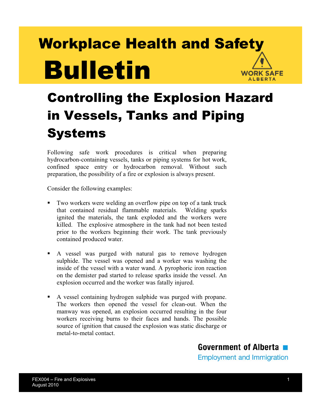 Before performing work involving a vessel, tank or piping system that contained or may contain hydrocarbons or other hazardous materials, the interior may need to be tested to determine if a flammable environment is present. 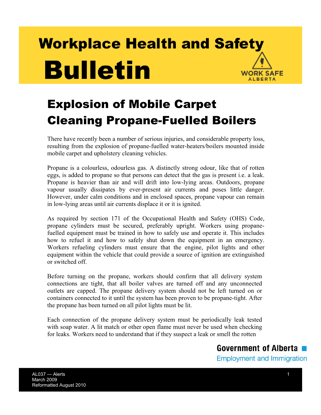 There have recently been a number of serious injuries, and considerable property loss, resulting from the explosion of propane-fuelled water-heaters/boilers mounted inside mobile carpet and upholstery cleaning vehicles. 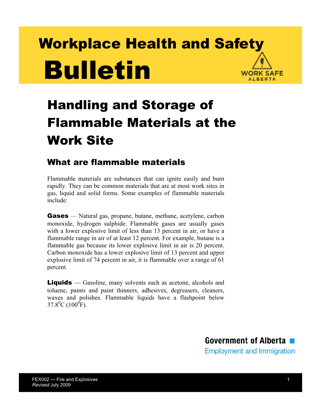 Flammable materials are substances that can ignite easily and burn rapidly. Hot work is any work process in which a flame is used or sparks or other sources of ignition may be produced. How do I prevent a safety hazard?